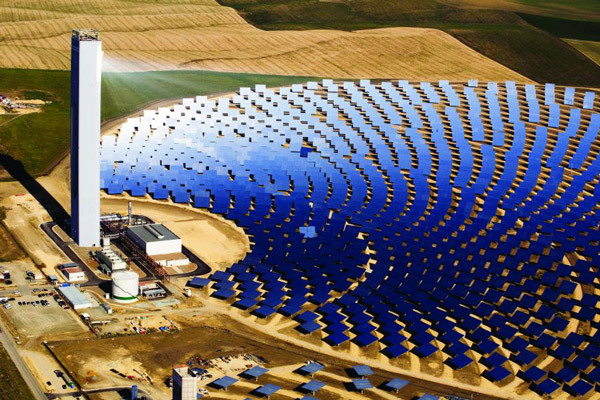 The PS20 concentrated solar thermal plant in Spain. The announcement of the closure of two Alinta coal power stations at Port Augusta in South Australia is an indicator of just how fast the energy industry can move, and how quickly we need to respond to change. No one could have predicted these power stations closing for economic reasons (sans carbon price) when the National Electricity Market was established some 16 years ago. These closures are somewhat of a surprise given the removal of the carbon price and Alinta’s recent statements about extending the life of the power station and coal mine at Leigh Creek in South Australia to 2030. While many view the closure of the coal fired power plants as yet another economic blow to South Australia – and indeed our thoughts go out to those individuals who depend on the power stations for their livelihoods – others will see this as an opportunity to further develop the renewable energy industry. South Australia already leads the way on renewable energy generation and the closure of a polluting “base load” power station reinforces the inevitable move towards a distributed energy system based on a range of renewable technologies. The increasing costs associated with energy that pollutes, produces waste and degrades the environment means the costs of non-renewables will continually rise. It is only a matter of time before a price is reintroduced on CO2, followed by other externalities including health costs, land rehabilitation, waterway clean-up and biodiversity loss. Other states will soon have their share of turmoil with the value of coal declining while the costs associated with coal increase. The question is, will the other states learn from this closure and start planning for transitions of their own? Australia needs to acknowledge the challenges ahead for our energy industry in order to successfully manage this transformation without sudden surprises such as those at Port Augusta, and the associated social consequences. It is an incontrovertible fact that our economy and society is entirely dependent on the environment and natural resources. It is thus essential that resources are used optimally and in a sustainable manner – meaning they are replenished at a rate equal to their consumption. The current diabolical position taken by our political leaders on matters of energy and sustainability is of great concern in how we deal with the future challenges and opportunities. Our leaders must apply rational thinking in the face of these facts and accept the risks posed by our unsustainable practices. They must develop a high-level energy transition plan that considers the technological aspects, future demands, and societal consequences on how employees, contractors and communities will evolve with the energy sector. It is encouraging that Alinta, with financial support from ARENA and the SA Government, is currently finalising a pre-feasibility study into concentrated solar thermal power at Port Augusta – a project that has the full support of the community. At present the capex of CSP is too high for a company to meet what is required for shareholder returns, but costs will decrease as the technology develops further. If government were to contribute an amount equivalent to saved externalities (such as adverse health effects associated with continuing the coal power station) it is probable that the project would be economically viable now. CSP is of particular value to a renewable grid, as it has the ability to efficiently store energy, be despatchable and provide synchronous generation and grid stability. These capabilities will circumvent the need for inflexible base load generators such as coal, CCGT and nuclear, with their many externalities. Port Augusta is an ideal location for CSP and presents a great opportunity for the future. The closure of the Port Augusta Power Station may initially appear as bad news, but it may galvanise South Australia in becoming the iconic turning point for a new future – a future in which Australia again leads in solar development and export; where energy security is based on the sun and not the fossil reserves; where long-term thinking is built into economic analysis; and where prosperity is not measured by GDP but by net wealth and wellbeing. Graham Davies is incoming chair of Engineers Australia’s Sustainable Engineering Society. Excellent words. Let’s hope decisionmakers take notice.